There are many types of heatpump thermostat that are used in the market today. In ductless split or mini split air cooled heatpump, the thermostats that are used are highly customized according to the specifications of the manufacturers. In ductless split heatpump, there is an indoor and an outdoor unit. The indoor unit consists of a variable fan speed, fan coil, sensors and main electronics control board. A remote control is used to control the settings of the unit. 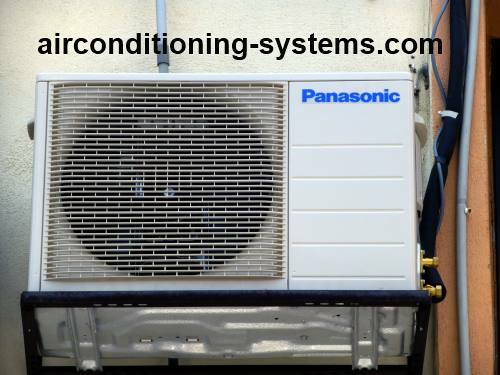 The outdoor unit consists of a condenser, outdoor fan, sensors, 4 Way valve and the compressor. Unlike the wall thermostat where you can change your own heatpump thermostat, this type of unit will require you to get the representative of the manufacturer to change or troubleshoot the controls in the event of problem. Refer to the operating manual of the unit for instruction in the event the unit is not working properly. Usually it will have diagnostic features that inform you what is wrong with the unit and whether you need to call a service technician. The indoor unit is located inside the room where cooling or heating of the space is required. The temperature of the space is obtained by using a thermistor that has different resistance value at different temperature. Turn on the power supply to the unit. When the remote control settings in COOL mode with a desired set temperature are transmitted to the receiver of the indoor unit, it will turn the unit ON. 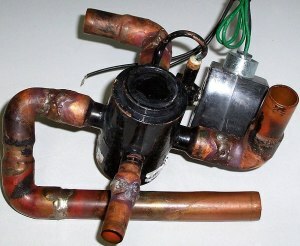 In this mode, the 4 Way Valve will turn OFF (in cooling mode) and the compressor will turn ON. The outdoor and indoor fans will also turn ON. During this time, cool air will be discharged by the indoor fan to the space until the desired set temperature of the room is obtained. When the desired temperature has been achieved, the compressor and the outdoor fan will turn OFF. When the temperature of the room increases, the compressor and outdoor fan will turn ON again to provide the cooling required. In newer energy saving design, an inverter compressor is used. In this case, the speed of the compressor can be varied instead of just ON or OFF. By varying the compressor speed, the load requirements of the space can be met with better precision hence giving better comfort to the occupants. This method of control is by far more efficient but the initial equipment cost is higher. During winter, the operation of the heatpump is set to HEAT mode by using the remote control provided. In heat mode, the refrigerant flow is reversed by the 4 Way Valve which turns ON (in heating mode) during heat cycle. In this way, the indoor unit becomes a condenser and the outdoor an evaporator. The compressor and outdoor fan turn ON. Similarly, the indoor fan tuns ON and blows the hot air on the coil to the room. This continues until the desired set temperature of the room is achieved. Once this is achieved, the compressor and outdoor fan will turn OFF. They will only turn ON when the room temperature drops below the set temperature. In inverter compressor, the speed can be varied hence making it a better and more efficient unit. If you have the budget, getting an inverter heat pump is definitely a good investment as it is more efficient hence saving energy and electricity bill. The heatpump thermostat usually has a feature known as the defrost function. During extreme winter condition when the outdoor temperature drops below 0 °C, ice will be formed on the outdoor coil as heat is continuously being extracted from the outdoor. When this happen, the sensor that senses the temperature will initiate a defrost function. During defrost, the unit will be running COOL mode to get rid of the ice on the outdoor unit. During this time, the indoor fan will turn OFF so as not to blow cool air into the room and cause discomfort to the occupants. Once the ice has been melted, the unit can start running heat mode again. When set to AUTO mode, the system will automatically set the mode to HEAT or COOL depending on the indoor temperature. There are certain conditions that need to be met in order for the system to change from one mode to the other. Refer to the manufacturer manual for better understanding of this mode.